Witamy! In spite of many misconceptions, Polish cuisine can be healthy and heart-smart! It’s not all about pierogi, kielbasa, or boiled potatoes. Most of us probably talk more about the heartier comfort food because those dishes are so delicious. They remind us of the way our Babcia’s cooked. But a quick look through the index of The Art of Polish Cooking, my Mom’s iconic and definitive cook book on Polish cuisine, shows that there are many dishes that are quite healthy and quite light. And I would bet a beautiful plate of our Marinated Beet Salad (which was featured recently by Healthy Aging Magazine) that contemporary cooking in Poland is just as healthy as in the Western world. This is a serious issue in our kitchen right now, because Laura is starting the process of perfecting heritage dessert recipes for our next book, and there’s going to be a lot of tasting going on. Last week she worked on the recipe for Pączki – the traditional filled donut-like confection. The first few were not perfect. But after the third batch we ended up with a freezer-full of goodness. Thankfully, the neighborhood ladies are coming for coffee this week! We can only give so much away to friends, family and the neighbors. So going light is a good thing and eating more fish and vegetables is a good thing. Here is a filet of sole recipe that is healthy and tasty. Sole is pretty easy to find in most good grocery stores, but can also be substituted with any lighter and thinner white fish filets such as flounder. We like Basa quite a bit, which is actually a Vietnamese cousin to the catfish but often sold in thinner filets. In a large skillet, heat the butter, add the vegetables and the water; sauté over medium heat until soft - about 5 minutes. Sprinkle the fish lightly with salt. Place on top of the vegetables and simmer until the fish is just cooked through – about 5 to 10 minutes depending on thickness. To test for doneness, pierce the filet lightly with a fork, turn it a bit to see if the fish is no longer opaque in color. When done the fish should be somewhat flaky under your fork. To prepare the sauce, heat the butter, add the flour, sauté while mixing until well blended. Dissolve the bouillon cubes in hot water and add the broth to the pan. Bring to a boil. Stir until slightly thickened. To serve, transfer the fish filets gently to a warm serving platter. Add the sauce to the vegetables. Remove from heat. Season lightly with salt and pepper to taste. Finish by stirring in the sour cream. Pour over the fish. Serve with Polish dumplings, rice or egg noodles. Smacznego! 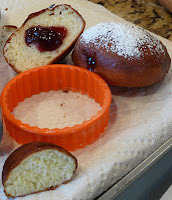 What happened to the recipe for the Paczki?? I don't care for fish but love Paczki. It will be in our dessert book...I promise!